A project of the Chemainus Festival of Murals Society, with support from the Chemainus Rotary club and the Municipality of North Cowichan, with special thanks to Ken Stanton, Castle Cove Builders Ltd. 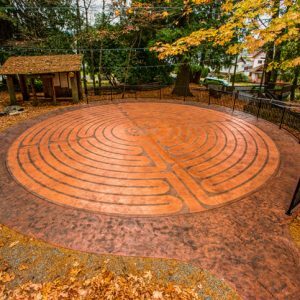 The Chemainus Labyrinth in Waterwheel Square, in the Breamore design, of the medieval style, is the latest addition to the approximately 75 labyrinths on Vancouver Island. Labyrinths are ancient human symbols known to go back at least 4,000 years and probably much further. They appeared on most inhabited continents in prehistory, with examples known from North and South America, Africa, Asia, and across Europe from the Mediterranean to Scandinavia. A labyrinth is not a maze; it is a walking meditation device with a single winding path from the edge to the centre. There are no tricks, choices, or dead ends in a labyrinth walk. 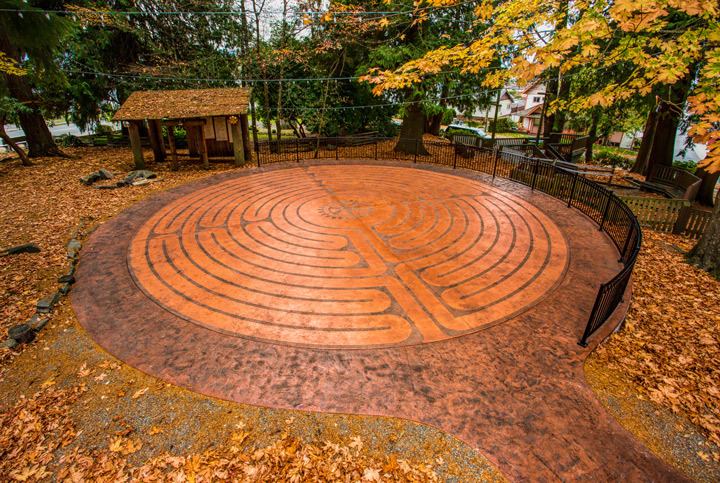 Labyrinths are walked for meditation, prayer, mindfulness, healing, creative stimulation, and just for fun.